The year is 2020. It's election year; David Cameron stood down as Tory leader in the spring of 2019, and in the ensuing leadership election, Chancellor George Osborne won convincingly. The Tories head into the election, with a fresh-faced new leader. What about dear old Labour? Poor Jeremy Corbyn didn't last long. Was a proper Julius Caesar-style coup. "The Ides of Corbyn" they call it. All in vain, because the guy who ousted him didn't last long. Labour has become brutalised, and purge after purge has left it weary and hungry for power. Now they have their third leader in just five years. Whatshisname or whatshername. They actually seem to have a chance of winning this time round. Keep it up, Leader X, and watch out, Mr Osborne. The election's not in the bag just yet. The UK economy seems to be humming along at a modest speed. Despite troubles in Eurozone (yes, still sluggish), things are going swimmingly. 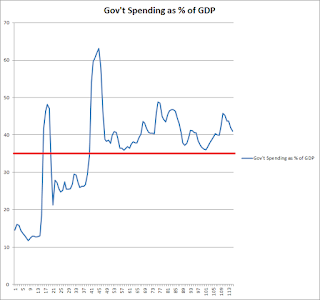 Except one thing is different; the budget deficit: it's gone! Whatever happened to it? In the weird and wacky election year that is 2020, deficits have gone out of style, don't you know? "In normal times, once a headline surplus has been achieved, the Treasury’s mandate for fiscal policy is: a target for a surplus on public sector net borrowing in each subsequent year"
Not content with trying to reduce the budget deficit to zero, George Osborne hopes to go further. He intends to move the budget into surplus by the time of the 2020 election. Then, to make Labour really cry, he wants to make budget surpluses the gold standard for "normal times", whatever those are. "The new targets will apply during ‘normal times’. If annual real growth in the UK economy is less than 1% the OBR will judge there to have been a significant negative shock, and the economy will be out of normal times....If the OBR judges that a negative shock has occurred, or will occur over the forecast period, the fiscal targets will be suspended." As seen above, there is a caveat. If the economy is hit by, say, a surge in commodity prices (as in 2008-11) or the Eurozone Crisis takes a new and deadly turn, an economy growing at 2% to 3% a year could end up in recession. Once it drops below 1% growth, the Fiscal Charter essentially gets suspended, because "normal times" are officially over. In this low growth period, governments would have free rein to run a deficit, if needs be. 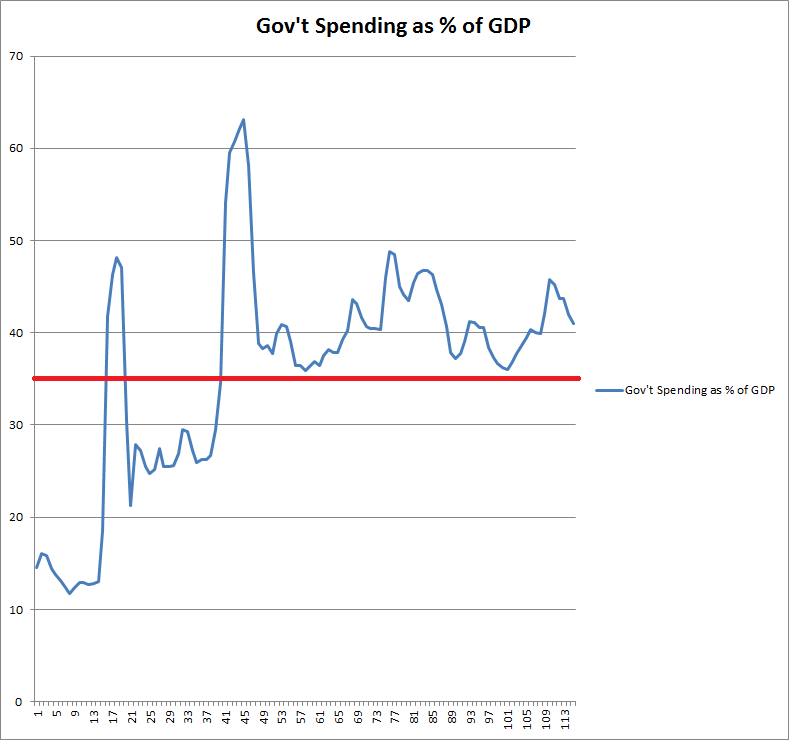 In the chart below, I have presented data showing government expenditure as a percentage of GDP, from 1900 to the present day. The recent peak is the depth of the 2008-09 recession, and you can see how the 2010-15 austerity rounds have brought it down a smidgen since then. The red line seen in the chart represents roughly 35.2%, the level at which George Osborne hopes to leave government expenditure, when David Cameron potentially hands him the keys to No10. The cuts being put into place between now and 2020 will trim the state back to levels not seen since the 1930s. This brings me to the concluding points of this post. The Conservatives, buoyed by recent electoral success, believe now is the chance to cut the state back to levels not seen since the 1930s (before the NHS even existed). Labour is suffering a violent electoral defeat spasm. The Conservatives have effectively use the Fiscal Charter vote a few hours ago, to sow division within the Labour Party. It seems to have worked. Shadow Chancellor John McDonnell changed his mind, and decided to try and oppose the Charter, but now the Tories will be able to accuse Labour of being spendthrift. The result has been decisive. The Charter just passed through the Commons, 320 to 258. 21 Labour MPs abstained, disobeying Jeremy Corbyn and John McDonnell. The Chancellor is reaching back into his bag, and pulling out the austerity scissors. He moves in. "Back for more, eh? ", he says. "Don't worry...This won't hurt a bit..."